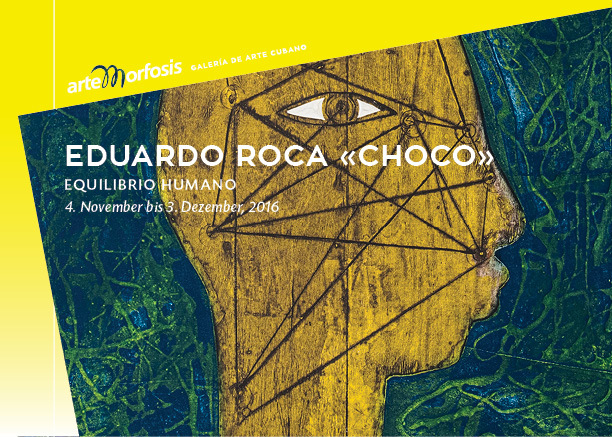 As the title ‘EQUILIBRIO HUMANO’ suggests, the works of the Afro-Cuban Artist Eduardo Roca «Choco» (*1949, Santiago de Cuba) are characterised by their search for equilibrium of man with himself, nature, his spirituality, his ancestry independent of ethnicity. His work – whether painting, sculpture or print – is characterised by it corporeality which is formed by the motives as well as materiality. ArteMorfosis is the first Swiss gallery to display oil paintings, collagraphies and wood sculptures in Switzerland of the international renowned artist. Master of collagraphy like no other in Cuba, his solid pasting and sensual volumes identify him among his contemporaries as the most advanced among the figurative expressionists with a vocation for abstraction. Choco is like his painting: delicate and at the same time expansive, penetrated by chiaroscuro and seductive by nature. His seduction compels us to savor his paintings with pleasure, to submerge into the rubber and the cellulose, to find support on the wood and linoleum, on the metal and vinyl. He takes us by the hand to a world where the aroma of tropical fruits, the arms and legs of bodies that mix in their ethnicity are captivating, to affirm the identity values of the island, to help us understand a cosmos he has created with his roots and his blood. Nobody pretends to decipher the mystery of his painting; it remains submerged in the artist’s heart. But indeed, in his art lies the essence of Cubanness, that forgotten essence; and what was forgotten he rescues with the tools of his talent and sensibility, and to which he grants universal rank. Choco knows that only art accompanies us on the adventure of transgression and metamorphosis. His work contributes to a better understanding among us as human beings, because in it we discover another road to the kingdom of fantasy we all hope to reach, and where art always leads us; this time by the hand of the great Choco.